My last TLC blog was in October. It feels as if a lot has happened since then. We’ve ‘popped up and down’ (believe me, it’s easier said than done) on many wonderful Wednesdays at The Hub and have learnt loads since our opening in September. Since September global tragedies have also been relentless and there are mounting levels of fear, fuelled by the media. I notice that these tragic world events play out in unsettling ways locally and I could write more about these things. However, I’d prefer to reflect this week on the small signs of hope I see. As I’ve described before, TLC is just a pop up cafe in a glorified portacabin. Yet it feels more than that. I’ve noticed that it’s a space where conversations are happening with people expressing empathy and connecting, on large issues and smaller every day matters. What I’m reflecting on this week is how TLC seems to be a safe place where genuine connections are being made between all sorts of people. We are learning about each others lives, our stories, families, histories and hopes. I’m reflecting this week on how friendships start, grow and deepen over time. I’m forever curious about how our lives overlap and and how we can journey together with all our different points of view. I’m deeply touched when global tragedies happen, as has happened in 2015 and how these affect my friends from different communities. I’m also moved by the conversations that have happened in TLC as we try to find our ways through such events. Each week at TLC we witness new conversations and connections happening and we are a part of these too. And this week in addition to the toast, cake, tea, coffee and hubbub of large and small conversations, a flurry of creativity was also going on. 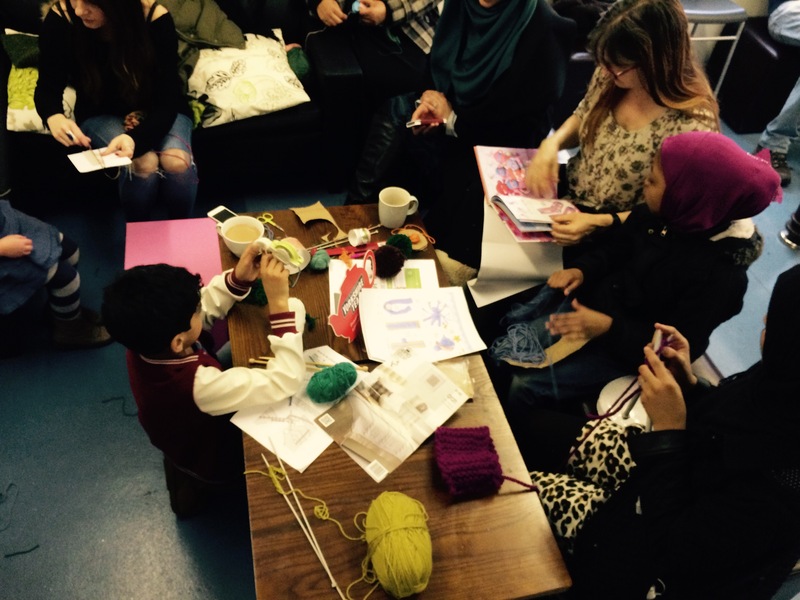 There was a joyful, creative corner, filled with children and adults, with mountains of colourful thread and wool for knitting, sewing and octopus pom pom making. In the midst of all of this I find that my hope in humanity is refreshed a little.